The Bhopal case is an in-depth study of the industrial accident at the Union Carbide factory in India that immediately killed 2,000 people, injured another 200,000 to 300,000 more, and immediately raised questions about plant safety and corporate responsibility around the world. Includes seven detailed appendices: A.) Chronology, B.) Stakeholders and Level of Responsibility, C.) Economic/industrial climate of India, D.) Union Carbide Corporation, E.) Issues in Chemical Processing, F.) Assessing Responsibility: The Legal/Regulatory System, G.) Assessing Responsibility: The Engineers and Scientists, and H.) Technical Expertise and Managerial Responsibility. The situation summary is a 7 page document detailing the industrial accident at the Union Carbide factory in India that immediately killed 2,000 people, injured another 200,000 to 300,000 more, and immediately raised questions about plant safety and corporate responsibility around the world. This file outlines the contents for the entire case study. It should serve as a cover page if all materials are printed out and act as a guide for instructors in choosing which appendices to assign. Appendix A, the chronology, is a 17 page document outlining the events leading up to and following the plant explosion. Dates outlined range from 1956 to 2007. The chronology is also color-coded to aid in identifying city and state measures relating to Bhopal, relevant Indian business legislation, casualties, and changes in economic conditions. Appendix B is designed to encourage students to consider the perspectives of various stakeholders associated with the Bhopal disaster including the government, the UC Corporation, and the victims. It also includes suggested outside readings and the following materials: 1.) H-O-T Analysis of Industrial Accidents Applied to Bhopal Gas Leak, 2.) Stakeholder Orientations in Industrial Disasters Table, 3.) Stakeholder Effects and Responses Table, 4.) Comparison of Features of MIC plants in West Virginia and Bhopal, and 5.) a student exercise: Identifying Responsibilities. Appendix C will provide students an overview of the economic and industrial climate in India at the time of the Bhopal disaster. The appendix includes 1.) IDEESE essay on India’s Approach to Economic Development, 2.) Excerpt from Report of the 9th International Symposium on the Prevention of Occupational Accidents and Diseases in the Chemical Industry, " Chemical Industries in India, summer 1984", 3.) Excerpts from and Comments on Union of India Foreign Exchange Regulation Act 1973, 4.) The Government of India, Planning Commission, 4th Five-Year Plan, and 5.) Government of India Tenth Five Year Plan: 2002-07. Appendix D provides details on the Union Carbide Corporation including how the corporation is organized, what safety issues they were aware of at the Bhopal Plant (1982) and their West Virginia facility (1985). Appendix E is designed specifically with scientists in mind. It addresses the toxicity of chemicals at the Bhopal Plant, the types of hazards in manufacturing and using industrial products, the types of hazards in product use and consumption, and outlines notes on making the chemical SEVIN. Appendix F examines the policy changes and litigation resulting from Bhopal disaster. It includes a Note on Indian Supreme Court decisions regarding the Bhopal disaster, Western European and United States policy information about chemical plant hazards, and links to several relevant Supreme Court decisions. Appendix G uses excerpts from legal proceedings to create "Contrasting Views of Responsibility for the Bhopal Disaster" and to assess the levels of responsibility for engineers and scientists involved in the UCC and Bhopal Plant. Appendix H uses IEEE and ASME Codes of Ethics to assess what levels of responsibility professional societies consider managers to have. The essay "Engineers and Managers" by MJ Peterson explains what options managers have when faced with an ethical dilemma. The Bhopal disaster, also referred to as the Bhopal gas tragedy, was a gas leak incident on the night of 2–3 December 1984 at the Union Carbide India Limited (UCIL) pesticide plant in Bhopal, Madhya Pradesh. It was considered as of 2010 to be the world's worstindustrial disaster. Over 500,000 people were exposed to methyl isocyanate (MIC) gas. The highly toxic substance made its way into and around the shanty towns located near the plant. The cause of the disaster remains under debate. The Indian government and local activists argue that slack management and deferred maintenance created a situation where routine pipe maintenance caused a backflow of water into a MIC tank, triggering the disaster. Union Carbide Corporation (UCC) contends water entered the tank through an act of sabotage. The owner of the factory, UCIL, was majority owned by UCC, with Indian Government-controlled banks and the Indian public holding a 49.1 percent stake. In 1989, UCC paid $470 million ($907 million in 2014 dollars) to settle litigation stemming from the disaster. In 1994, UCC sold its stake in UCIL to Eveready Industries India Limited (EIIL), which subsequently merged with McLeod Russel (India) Ltd. Eveready ended clean-up on the site in 1998, when it terminated its 99-year lease and turned over control of the site to the state government of Madhya Pradesh. Dow Chemical Company purchased UCC in 2001, seventeen years after the disaster. The UCIL factory was built in 1969 to produce the pesticide Sevin (UCC's brand name for carbaryl) using methyl isocyanate (MIC) as an intermediate. An MIC production plant was added in 1979. After the Bhopal plant was built, other manufacturers, including Bayer, produced carbaryl without MIC, though at a greater manufacturing cost. Bayer also used the UCC process at the chemical plant once owned by UCC at Institute, West Virginia, in the United States. The chemical process employed in the Bhopal plant had methylamine reacting with phosgene to form MIC, which was then reacted with 1-naphthol to form the final product, carbaryl. This "route" differed from the MIC-free routes used elsewhere, in which the same raw materials were combined in a different manufacturing order, with phosgene first reacting with naphthol to form a chloroformate ester, which was then reacted with methylamine. In the early 1980s, the demand for pesticides had fallen, but production continued, leading to build-up of stores of unused MIC. In 1976, two local trade unions complained of pollution within the plant. In 1981, a worker was accidentally splashed with phosgene as he was carrying out a maintenance job of the plant's pipes. In a panic, he removed his gas mask and inhaled a large amount of toxic phosgene gas, leading to his death just 72 hours later. In January 1982, a phosgene leak exposed 24 workers, all of whom were admitted to a hospital. None of the workers had been ordered to wear protective masks. One month later, in February 1982, a MIC leak affected 18 workers. In August 1982, a chemical engineer came into contact with liquid MIC, resulting in burns over 30 percent of his body. Later that same year, in October 1982, there was another MIC leak. In attempting to stop the leak, the MIC supervisor suffered severe chemical burns and two other workers were severely exposed to the gases. During 1983 and 1984, there were leaks of MIC, chlorine, monomethylamine, phosgene, and carbon tetrachloride, sometimes in combination. The Bhopal UCIL facility housed three underground 68,000 liters liquid MIC storage tanks: E610, E611, and E619. In the months leading up to the December leak, liquid MIC production was in progress and being used to fill these tanks. UCC safety regulations specified that no one tank should be filled more than 50% (here, 30 tons) with liquid MIC. Each tank was pressurized with inert nitrogen gas. This pressurization allowed liquid MIC to be pumped out of each tank as needed, and also kept impurities out of the tanks. In late October 1984, tank E610 lost the ability to hold most of its nitrogen gas pressure. It meant that the liquid MIC contained within could not be pumped out. At the time of this failure, tank E610 contained 42 tons of liquid MIC. Shortly after this failure, MIC production was halted at the Bhopal facility, and parts of the plant were shut down for maintenance. Maintenance included the shutdown of the plant's flare tower so that a corroded pipe could be repaired. With the flare tower still out of service, production of carbaryl was resumed in late November, using MIC stored in the two tanks still in service. An attempt to re-establish pressure in tank E610 on 1 December failed, so the 42 tons of liquid MIC contained within still could not be pumped out of it. In early December 1984, most of the plant's MIC related safety systems were not functioning and many valves and lines were in poor condition. In addition, several vent gas scrubbers had been out of service as well as the steam boiler, intended to clean the pipes. During the late evening hours of 2 December 1984, water was believed to have entered a side pipe and into Tank E610 whilst trying to unclog it, which contained 42 tons of MIC that had been there since late October. Introduction of water into the tank began a runawayexothermic reaction, which was accelerated by contaminants, high ambient temperatures and other factors, such as the presence of iron from corroding non-stainless steel pipelines. The pressure in tank E610, normal at 10:30 p.m., had increased by a factor of five to 10 psi (34.5 to 69 kPa) by 11 p.m. Two different senior refinery employees assumed the reading was instrumentation malfunction. By 11:30 p.m., workers in the MIC area were feeling the effects of minor exposure to MIC gas, and began to look for a leak. One was found by 11:45 p.m., and reported to the MIC supervisor on duty at the time. The decision was made to address the problem after a 12:15 a.m. tea break, and in the meantime, employees were instructed to continue looking for leaks. The leak was discussed by MIC area employees during the break. About 30 metric tons of MIC escaped from the tank into the atmosphere in 45 to 60 minutes. This would increase to 40 metric tons within two hours time. The gases were blown in a southeasterly direction over Bhopal. Bhopal's superintendent of police was informed by telephone, by a town inspector, that residents of the neighbourhood of Chola (about 2 km from the plant) were fleeing a gas leak at approximately 1 a.m. Calls to the UCIL plant by police between 1:25 and 2:10 a.m. gave assurances twice that "everything is OK", and on the last attempt made, "we don't know what has happened, sir". With the lack of timely information exchange between UCIL and Bhopal authorities, the city's Hamidia Hospital was first told that the gas leak was suspected to be ammonia, then phosgene. They were then told that it was "MIC", which hospital staff had never heard of, had no antidote for, and received no immediate information about. Apart from MIC, based on laboratory simulation conditions, the gas cloud most likely also contained chloroform, dichoromethane, hydrogen chloride, monomethyl amine, dimethylamine, trimethylamine and carbon dioxide, that was either present in the tank or was produced in the storage tank when MIC, chloroform and water reacted. The gas cloud, composed mainly of materials denser than air, stayed close to the ground and spread in the southeasterly direction affecting the nearby communities. The chemical reactions may have produced a liquid or solid aerosol. Laboratory investigations by CSIR and UCC scientists failed to demonstrate the presence of hydrogen cyanide. There were mass funerals and cremations. Photographer Pablo Bartholemew, on commission with press agency Rapho, took an iconic color photograph of a burial on December 4, Bhopal gas disaster girl. Another photographer present, Raghu Rai, took a black and white photo. The photographers did not ask for the identity of the father or child as she was buried, and no relative has since confirmed it. As such, the identity of the girl remains unknown. Both photos became symbolic of the suffering of victims of the Bhopal disaster, and Bartholomew's went on to win the 1984 World Press Photo of the Year. Within a few days, trees in the vicinity became barren and bloated animal carcasses had to be disposed of. 170,000 people were treated at hospitals and temporary dispensaries; 2,000 buffalo, goats, and other animals were collected and buried. Supplies, including food, became scarce owing to suppliers' safety fears. Fishing was prohibited causing further supply shortages. 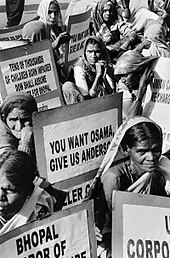 Legal proceedings involving UCC, the United States and Indian governments, local Bhopal authorities, and the disaster victims started immediately after the catastrophe. The Indian Government passed the Bhopal Gas Leak Act in March 1985, allowing the Government of India to act as the legal representative for victims of the disaster, leading to the beginning of legal proceedings. Initial lawsuits were generated in the United States federal court system. On April 17, 1985, Federal District court judge John F. Keenan (overseeing one lawsuit) suggested that "'fundamental human decency' required Union Carbide to provide between $5 million and $10 million to immediately help the injured" and suggested the money could be quickly distributed through the International Red Cross. UCC, on the notion that doing so did not constitute an admission of liability and the figure could be credited toward any future settlement or judgement, offered a $5 million relief fund two days later. The Indian government turned down the offer. US Federal class action litigation, Sahu v. Union Carbide and Warren Anderson, had been filed in 1999 under the U.S. Alien Torts Claims Act (ATCA), which provides for civil remedies for "crimes against humanity." It sought damages for personal injury, medical monitoring and injunctive relief in the form of clean-up of the drinking water supplies for residential areas near the Bhopal plant. The lawsuit was dismissed in 2012 and subsequent appeal denied. Anderson died in 2014. Children’s health: Peri- and neonatal death rates increased. Failure to grow, intellectual impairment, etc. Missing or insufficient fields for research are female reproduction, chromosomal aberrations, cancer, immune deficiency, neurological sequelae, post traumatic stress disorder (PTSD) and children born after the disaster. Late cases that might never be highlighted are respiratory insufficiency, cardiac insufficiency (cor pulmonale), cancer and tuberculosis. The Government of India had focused primarily on increasing the hospital-based services for gas victims thus hospitals had been built after the disaster. When UCC wanted to sell its shares in UCIL, it was directed by the Supreme Court to finance a 500-bed hospital for the medical care of the survivors. Thus, Bhopal Memorial Hospital and Research Centre (BMHRC) was inaugurated in 1998 and was obliged to give free care for survivors for eight years. BMHRC was a 350-bedded super speciality hospital where heart surgery and hemodialysis were done. There was a dearth of gynaecology, obstetrics and paediatrics. Eight mini-units (outreach health centres) were started and free health care for gas victims were to be offered till 2006. The management had also faced problems with strikes, and the quality of the health care being disputed.Sambhavna Trust is a charitable trust, registered in 1995, that gives modern as well as ayurvedic treatments to gas victims, free of charge. In order to provide safe drinking water to the population around the UCIL factory, Government of Madhya Pradesh presented a scheme for improvement of water supply. In December 2008, the Madhya Pradesh High Court decided that the toxic waste should be incinerated at Ankleshwar in Gujarat, which was met by protests from activists all over India. On 8 June 2012, the Centre for incineration of toxic Bhopal waste agreed to pay ₹250 million (US$3.8 million) to dispose of UCIL chemical plants waste in Germany. On 9 August 2012, Supreme court directed the Union and Madhya Pradesh Governments to take immediate steps for disposal of toxic waste lying around and inside the factory within six months. Immediate relieves were decided two days after the tragedy. Relief measures commenced in 1985 when food was distributed for a short period along with ration cards.Madhya Pradesh government's finance department allocated ₹874 million (US$13 million) for victim relief in July 1985. Widow pension of ₹200 (US$3.10)/per month (later ₹750 (US$11)) were provided. The government also decided to pay ₹1,500 (US$23) to families with monthly income ₹500 (US$7.70) or less. As a result of the interim relief, more children were able to attend school, more money was spent on treatment and food, and housing also eventually improved. From 1990 interim relief of ₹200 (US$3.10) was paid to everyone in the family who was born before the disaster. The final compensation, including interim relief for personal injury was for the majority ₹25,000 (US$380). For death claim, the average sum paid out was ₹62,000 (US$950). Each claimant were to be categorised by a doctor. In court, the claimants were expected to prove "beyond reasonable doubt" that death or injury in each case was attributable to exposure. In 1992, 44 percent of the claimants still had to be medically examined. In 2007, 1,029,517 cases were registered and decided. Number of awarded cases were 574,304 and number of rejected cases 455,213. Total compensation awarded was ₹15,465 million (US$240 million). On 24 June 2010, the Union Cabinet of the Government of India approved a ₹12,650 million (US$190 million) aid package which would be funded by Indian taxpayers through the government. Underinvestment is cited as contributing to an environment. Attempts to reduce expenses affected the factory's employees and their conditions. Kurzman argues that "cuts ... meant less stringent quality control and thus looser safety rules. A pipe leaked? Don't replace it, employees said they were told ... MIC workers needed more training? They could do with less. Promotions were halted, seriously affecting employee morale and driving some of the most skilled ... elsewhere". Workers were forced to use English manuals, even though only a few had a grasp of the language. According to the "Corporate Negligence" argument, workers had been cleaning out pipes with water nearby. This water was diverted due to a combination of improper maintenance, leaking and clogging, and eventually ended up in the MIC storage tank. Indian scientists also suggested that additional water might have been introduced as a "back-flow" from a defectively designed vent-gas scrubber. None of these theoretical routes of entry were ever successfully demonstrated during tests by the Central Bureau of Investigators (CBI) and UCIL engineers. A key witness (the "tea boy") testified that when he entered the control room at 12:15am, prior to the disaster, the "atmosphere was tense and quiet". The primary financial restitution paid by UCC was negotiated in 1989, when the Indian Supreme Court approved a settlement of US$470 million (₹1,055 crore (equivalent to ₹80 billion or US$1.2 billion in 2017)). This amount was immediately paid by UCC to the Indian government. The company states that the restitution paid "was $120 million more than plaintiffs' lawyers had told U.S. courts was fair" and that the Indian Supreme Court stated in its opinion that "compensation levels under the settlement were far greater than would normally be payable under Indian law." From 2014, Dow is a named respondent in a number of ongoing cases arising from Union Carbide’s business in Bhopal. UCC's laboratory tests in 1989 revealed that soil and water samples collected from near the factory were toxic to fish. Twenty-one areas inside the plant were reported to be highly polluted. In 1991 the municipal authorities declared that water from over 100 wells was hazardous for health if used for drinking. In 1994 it was reported that 21% of the factory premises were seriously contaminated with chemicals. Beginning in 1999, studies made by Greenpeace and others from soil, groundwater, well water and vegetables from the residential areas around UCIL and from the UCIL factory area show contamination with a range of toxic heavy metals and chemical compounds. Substances found, according to the reports, are naphthol, naphthalene, Sevin, tarry residues, alpha naphthol, mercury, organochlorines, chromium, copper, nickel, lead, hexachlorethane, hexachlorobutadiene, pesticide HCH (BHC), volatile organic compounds and halo-organics. Many of these contaminants were also found in breast milk of women living near the area.